About the Crowd - Miami Beach Party Crowd is a curated experience, delivering a personalized immersion in the amazing Miami South Beach Nightlife. it's A Curated Experience of south beach nightlife for you! Designed to give you the time of your life, join the Crowd for a guaranteed fun night out on the Beach. In the Crowd, you are a ROCKSTAR, and you will party like one! 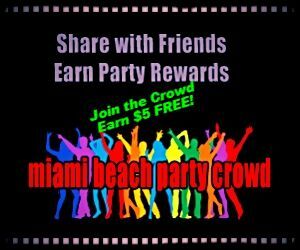 Miami Beach Party Crowd is a one of a kind party event. In the Crowd, you will have the fun you imagined for your night out on the Beach, partying in the company of friends. It's not a party if you are drinking alone! It's all about YOUR experience! Are you a travelling jet setter, taste maker, or professional looking for a sophisticated, cultured, fashion-conscious yet relaxed social experience to meet and party with interesting people, just like you, from all over the world? Have you been there, done that, and know your time is valuable? Are you looking for a no-surprise, stress-free experience for your night out on the Beach? Then you belong in the Crowd! We believe there is more to a party than meets the eye. At the end of the day, it all boils down to your experience. Crowd parties are designed on a simple premise: as social beings, we are simply happier in the company of others just like us. Crowd parties are all about creating opportunities to help you make those real human connections. When we do, you experience an infinitely more satisfying level of consciousness, something we like to call an Organic High! No, not that kind, silly. We are talking about an all natural high. All you need is a friendly smile, an outgoing personality and a curiosity to meet, inspire and be inspired. Don't worry, we drink too, and even enjoy an occasional smoke, or two. But charming companions and stimulating conversations is our stimulant of choice! So welcome to the Crowd! The Crowd Experience is a ROCKSTAR experience! Amazing level of service from accessible, attentive hosts/hostesses. A fun, engaging melting pot that will entertain, engage, and inspire. Personal introductions by our hosts/hostesses to your fellow PartyKins! NO WAITING IN LINE, ANYWHERE. Yes, especially @ the Dance Clubs. Guaranteed entry to South Beach's Premier Dance Clubs. Guaranteed table service at South Beach's Premier Dance Clubs. Maximum ROCKSTAR fun on a FIXED budget - yes, drinks included! An experience that matches your expectations. 1 ticket, 3 parties, 10 PM - 5 AM = One Amazing Night on South Beach! Our dance parties are designed around a simple format - 3 parties, truly personal concierge service, great hosts, VIP access to the best eateries, lounges & dance clubs. And, most important, one-on-one introductions to like-minded people you can PARTY with! Even on South Beach, there are those rare days when dance clubs are closed. On these days, for the Party Addict, the party continues with our signature Mixer Parties. Delivering the same level of experience by our hosting team, we focus on cultured, entertaining and inspiring acts on the Beach. The Pre-Party, from 10 PM - 12 AM. Meet, mix and mingle with the Crowd. WE BREAK THE ICE with a mix of innovative social games, personal one-on-one introductions, amazing hosts and hostesses, you will never have more fun meeting and making new friends. Plug into the Crowd, and get REALLY ready to party like a ROCKSTAR! The Crowd is a private party for people who like to party and party well! Learn more about the Crowd. What is the average size of each Party? We try and keep each party Crowd cozy and intimate. Each party Crowd is between 40 to 50 guests, assuring Crowd variety and kinship. What is the men to women ratio at the Party? We work very hard to maintain a gender balance in our parties. Which means 50/50 ratio that is so very critical to a fun party! Do you provide transportation to/from the Party? No, we don't. You will need to get to the Preparty venue on your own. However, we provide full stretch limo transportation between all our party venues. It's all part of our party experience. And at the end of the party, we make sure you get home safe. Our party hosts/hostesses can arrange a taxi for you back home! How do I get from one party location to another? The Crowd Party is all about having a ROCKSTAR experience. We provide stretch limo transportation between all party venues. So you can continue the party enroute to the next party! Do I have to wait in line at the dance clubs? No, with the Crowd, you will skip the line and get to party fast! Do you provide Table Servuce/VIP/Bottle Service at Dance Clubs? Yes, we do. You can purchase table-service tickets whenever available on our scheduled parties. Table Service pricing is very fluid on the Beach. It depends the location of the Table in the Club, the season, and of course, if any special programming is scheduled by the Dance Club for that night. As such, Table Service pricing at the Beach's premier nightclubs fluctuate between $ 350 on regular nights to $ 1450 to special events/seasons. We work very hard to deliver Table Service whenever possible for our guests. If we don't have table service tickets on any party you want to attend, simply give us a call toll free @ +1 (888) 380-6707 and we may be able to arrange one for you. How much can I expect to spend on a night out on the Beach? Our party pass ticket prices reflect the seasonal pricing of Dance/Nightclub prices on the Beach. Our Party Pass Ticket is priced between $ 150 ( Mixer Parties) and $ 250 ( Dance Parties ). Our Party Pass Ticket + Table Service Ticket ( Dance Parties only ) is priced between $ 350 ( regular nights )- $ 1450 ( special event nights ). 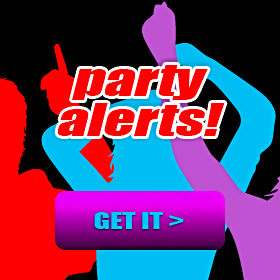 Check our party listings for exact ticket pricing. In addition, depending on the venue, the average cocktail can be anywhere from $ 10-40. A casual drinker should expect to spend between $ 50 - $ 200 on a night out on the Beach. Although, we typically provide either an open bar or semi-open bar at the preparty and after party, you should still come prepared with a drinking budget! We have a party every single day! Simply find the party you want to attend and purchase your tickets. Tickets are available for purchase online 8 days before the party. Tickets are no longer available 24 hours before the event. Our party calendar & schedule is here. Simply browse the events calendar to find an event you want to attend, and purchase your tickets. Our events calendar is here. Can I purchase tickets at the door on the day of the Party? Sorry, no. We do not sell tickets at Party venues. Reservations/tickets are available online, 24 hours before the event. Are free drinks included in the ticket price? Yes. Drinks are included in the ticket price. For the PreParty and After Parties venues, depending on the venue, we provide complimentary Open or Semi-open Bars. An Open Bar means all free drinks! A Semi-open bar means guests are provided with limited of free drinks or heavily discounted drinks! For Dance Parties and Mixer Party venues, drinks are NOT included in regular party pass tickets. However, drinks are included with Table Service Tickets. Help, the party I want is sold out! What can I do? Unfortunately, not much. We take great pride in curating our party experience, so we have a strict limit on how many guests can attend each party. Help, tickets are not yet available for the Party I want! What can I do? Yes, we typically post ticket prices 8 days ( 1 week ) before the event. This is simply due to the fact that pricing at the Beach's premier nightclubs is very, very fluid. Dance clubs set prices based on demand, season, performing artist/DJ, celebrities in attendance and so on. Pricing for entrance, VIP and Table Services usually firms up the week of the party. To make it easier for you to get tickets for the party that you want to attend, simply follow the party! On the party page, find and click on the +Follow button to receive an email alert when tickets pricing are posted for the party. We accept payments via Paypal, so you can pay with your credit/debit card and electronic checks. I live outside the US. How do I pay for my tickets? Paypal supports a lot of countries ( see here for complete list ), so try it first. If your country is not supported, please contact our helpdesk and we may be able to arrange an alternate payment method. All locations of the PRE, DANCE and AFTER parties are printed on your event registration ticket. Party starts with the Pre Party! So, on the day of the event, simply join the Pre Party Crowd. Our hosting team will be onsite to welcome you and plug you in the Crowd. What is the Party dress code? Be yourself but dress to impress. South Beach's premier dance clubs reserve the right to refuse entry if improperly attired. Guys, please don a jacket! Can I skip any of the Parties? Yes, but we recommend you make the Pre Party, so our hosting team can properly check you in the Crowd. Once checked in, you can do anything you want, leave and join the Crowd as you need. Why is the Check-in important? One simple reason: loooong lines at the dance clubs! We work hard with the dance club management to skip these buzz kills for our guests, and the Pre Party check-in is where we deliver the Party Passes for the night. With your Party Pass in hand, even if you are NOT with the Crowd, you can still breeze into the Dance Party when you are ready. I am unable to attend the Party. What is your refund policy? We provide full refunds for tickets/registrations received 72 hrs or 3 days before the date/time of event. Simply contact Helpdesk. Refunds are processed and confirmed within 24hrs. Do you guys offer daytime events too? No, we surveyed our team, and nobody is awake at those times. FAQs Find an event & get your Party Pass now!